In 2017 we achieved our highest ever recycled glass use and recycled glass content in our insulation products, recycling over 1.4 billion pounds. Owens Corning is a leader in recycled content for fiberglass insulation, ranging from a minimum of 53% recycled content to a high of 73% recycled content in our Canadian-made products. We also have high certified post-consumer content in our light-density building insulation. Our North American residential fiberglass insulation is certified by SCS Global Services to contain at least 55% recycled content, while our commercial and industrial fiberglass insulation is certified to have a minimum of 53% recycled content. 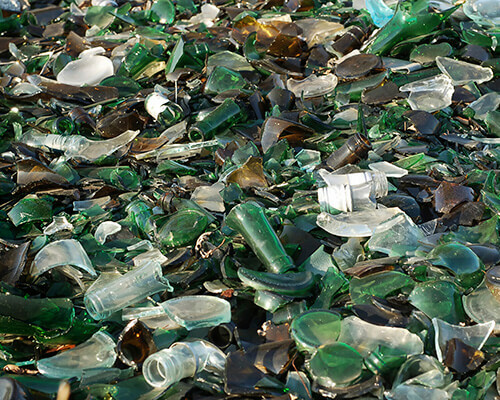 In 2017, we consumed over 1.4 billion pounds of recycled glass globally. Additionally, our XPS foam insulation in North America has 20% certified pre-consumer content. To develop sources for recycled material, we work with suppliers such as Ripple Glass in Kansas City, Missouri, where we assisted in establishing a waste glass processing plant, which takes 85% of the collected glass to be made into insulation. In addition, our Thermafiber® Mineral Wool Insulation is manufactured to have a minimum of 70% recycled content and is validated by ICC-ES. Owens Corning is one of the largest users of recycled glass in the world, using over 1 billion pounds annually of curbside consumer containers and pre-consumer recycled glass. Not only does this decrease community landfill waste, but it also lowers our energy use when manufacturing insulation, since starting with raw materials such as sand requires more energy. Although we strive for higher recycled-glass content in our insulation products, we realize that the supply of recycled glass is at risk. According to the United States Environmental Protection Agency and reported by the Glass Packaging Institute, only approximately 33% of all glass containers were recycled in 2014 (the last year that such data have been published). In addition, numerous municipalities across the U.S. have removed glass from their curbside recycling programs, further threatening future cullet supply. To help counteract these trends, Owens Corning works actively with other companies and organizations to support the glass recycling industry and the entire glass recycling supply chain. The Glass Recycling Coalition (GRC) and the North American Insulation Manufacturers Association (NAIMA) are two of our key partners. Through GRC, we are particularly focused on promoting glass recycling in Baltimore/Washington, D.C., the Carolinas, Florida, New York City, and Tennessee. We also helped form a glass cullet task force, with the objectives of: (1) improving communication on end use of glass containers to make fiberglass, (2) increasing glass container recycling rates, (3) improving glass cullet quality, and (4) protecting current recycling programs at the state and local levels. In addition, Owens Corning participates in several educational and informational workshops, including those by the Closed Loop Fund and recycled glass processor Strategic Materials, to promote open dialogue and collaboration among stakeholders interested in glass recycling. As a result of our efforts, and despite ongoing challenges in a number of communities across the U.S., we increased our use of post-consumer bottle glass in North America in 2017 and achieved our highest ever recycled glass use and recycled glass content in our insulation products, recycling over 1.4 billion pounds. We believe the availability of high-quality recyclable glass is critical to the ongoing execution of our growth strategy. For more information on glass recycling, visit www.glassrecycles.org. We are also proud to report that though our strategic partnership with Ripple Glass in Kansas City, in the spring of 2017, 1 billion bottles have been recycled since Ripple began operations in 2009. Owens Corning’s Kansas City insulation plant is a significant recipient of the glass being recycled through Ripples operation. And according to Ripple, recycling 1 billion bottles saves enough electricity to power every home in the Kansas City area for 18 days! 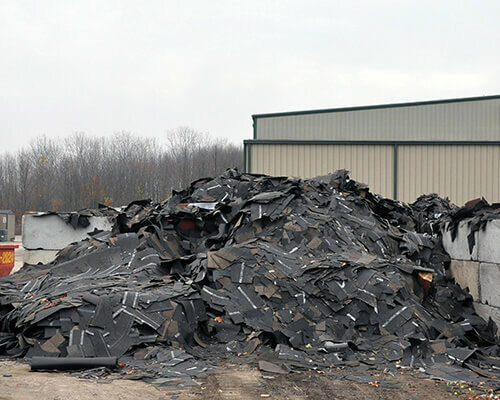 Owens Corning Roofing and Asphalt, is committed to a national strategic alliance with Earth911.com to help connect contractors with convenient shingle recycling facilities across the country. As part of this Owens Corning recycling effort, the program allows contractors to take the Preferred Contractor Shingle Recycling Pledge, committing to recycle their shingle tear-offs and giving them promotional marketing materials to help communicate to homeowners. 74% of our contractors have taken the pledge. Stockpile of material, and difficulty in getting asphalt companies to take the material. Owens Corning is supporting reasearch and development projects to find more end uses for recycled shingle materials, in addition to paving, so that recycling can be increased as a viable end of life solution. Our fiberglass insulation products are certified to have a minimum of 53% recycled content and in some areas we have as much as 73%, while continuing to provide the same energy-saving performance our customers expect. Foamular® extruded polystyrene insulation products use a minimum of 20% recycled content, using waste from various foam manufacturing operations. Both product lines are certified by SCS Global Services for recycled content, providing building professionals documentation that these products can contribute to meeting green building guidelines such as LEED® certification. Thermafiber® mineral wool insulation has a minimum 70% recycled content and is validated by ICC Evaluation Services. Contact 1-800-GET-PINK® for more information on recycled content in any of our products.